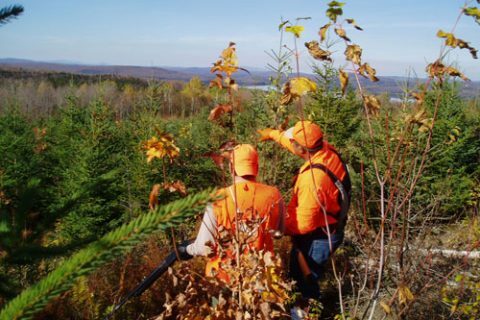 Autumn comes early in the Great North Woods, and that’s great news for our guests who like to don their orange vests and hats and head out into the woods in search of game. Our rugged, mountainous terrain provides ideal habitat for Northern whitetail deer, as well as bird species like grouse, woodcock and pheasant. Hunters visit our area every year in hopes of bagging their limit. There are more than 200,000 acres here in Pittsburg: dense spruce forests give way to areas of clearcut woods. Our ample mountain streams, high mountain bogs and the fertile river valleys are all accessible thanks to numerous logging roads. The State of New Hampshire generously allows recreational use of the land. Pittsburg is famous for its large bucks, frequently exceeding 200 pounds. The Indian Stream valley is a favorite of big buck hunters, while others prefer the Magalloway Mountain area. Snow often arrives early, sometime during October, which makes tracking easier. 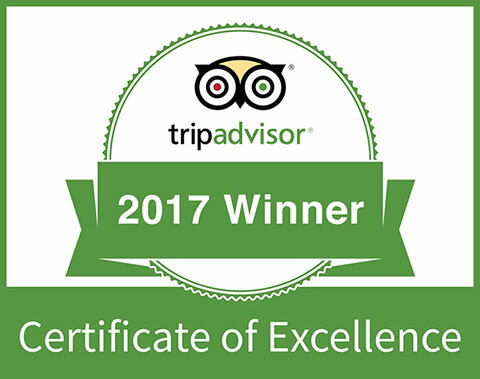 At Lopstick, we welcome our hunting guests, many of whom return year after year. Lopstick Outfitters offers experienced hunting guides with their trained bird dogs. They know the best fields and roads where the birds can be flushed out for excellent action. At the end of a long day on the hunt, there’s nothing better than returning to your cozy Lopstick cabin. Many of our cabins have gas and wood-burning fireplaces and stoves, and some even offer a Jacuzzi or a hot tub for relaxing after a strenuous day. All our cabins have fully equipped kitchens, too. With our unbeatable terrain, comfortable accommodations, and excellent package deals, the Lopstick Hunting Experience is hard to beat anywhere in New England. Call us today and begin planning your next hunting adventure in the Great North Woods. Our deer hunting season begins the second week in September until the end of November. The days are usually crisp but clear, and you’ll appreciate the warmth of your cabin’s fireplace or stove at night. With more than 200,000 acres, your choices in hunting habitat are wide and varied. 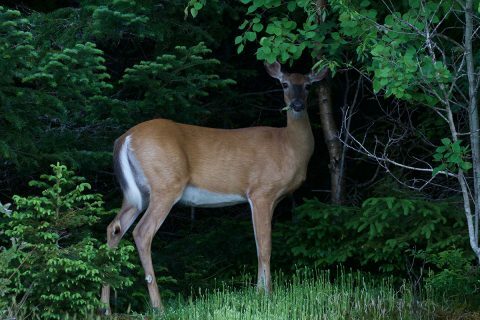 Thanks to the well-maintained logging roads, you can get deep into the woods where the big bucks roam. Our Deer Camp Hunting Package is good for 3 or 4 nights accommodations, and our cabins can sleep from four to seven guests. Click here for details. The Great North Woods region around Lopstick consists of some of the best grouse and woodcock cover in all of New England. Our mountainous terrain is the ideal setting for a great afternoon hunt.The bogs, streams, and numerous maintained logging roads provide easy in and out access to the hunting areas. The birds prefer our great ground cover, and like to feast on the fruits of our native vegetation: mountain ash, high bush cranberry, raspberry, chockcherry and partridge berry. Bird season begins October 1st and continues through December 31. Sunday hunting is permitted in New Hampshire. Many of our repeat guests bring their own dogs, hunting gear, and know where their favorite places are. But hunters new to the area may want to hire one of our experienced guides. 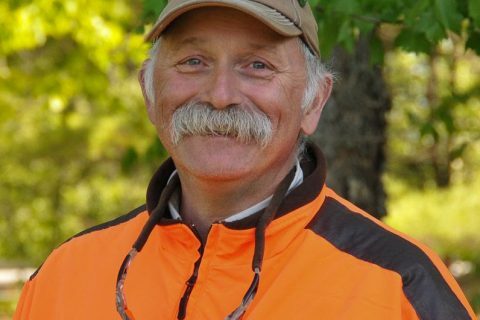 Our two guides and their well-trained German shorthair pointers will be eager to get you onto birds in some of the great covers in Pittsburg NH. Lopstick Outfitters stocks a good selection of hunting gear to buy. We can do a hunting license for you when you arrive. You will need proof of taking a hunters safety course or a previous hunting license. Of course, at the end of a long day of hunting, your cozy and comfortable cabin at Lopstick is a welcome and relaxing refuge. Many of our cabins have gas or wood-burning stoves or fireplaces, and some also have a Jacuzzi or a hot tub. But all our cabins offer comfortable seating, fully equipped kitchens and tremendous views. Our Grouse Hunting Package offers excellent value for three-night stays. We offer upland bird hunting guide service October 1st through early November. 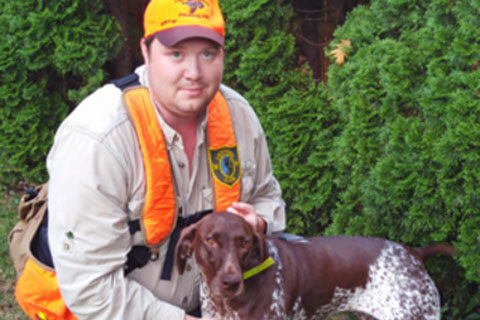 Hunt for ruffed grouse, woodcock and pheasant over our trained German Shorthair Pointers or bring your own dog. Join us for a North Woods hunting adventure. Let us show you the grouse woods of northern New England! The day afield begins at 8 am at our office where you meet your guide. From there we take to the woods. Enjoy a delicious picnic lunch and return to your cabin in time to relax before dinner. Advance reservations are encouraged for bird hunting guide service due to the season length and guide availability. We offer upland bird hunting guide service to our guests during the month of October. A full day begins at approximately 8 am and ends 4-5 pm and a half day begins at 8 am and ends at 12- 12:30 pm. A woods lunch is provided for full day hunts and a morning snack is provided for half day hunts.